The RADIO ANTENNA PREAMP KIT (#PREAMP) from MTM Scientific is for building a low noise radio antenna preamplifier for the 1 to 30 MHZ frequency range. This kit is based on the classic design of W7IUV, according to these Published Plans (Courtesy of W7IUV). The plans emphasize the importance of using specific parts, which can be expensive and time consuming to gather. The MTM kit contains the correct parts and also includes a circuit board to simplify construction and create a nice finished project. This preamplifier is generally used with receiving antennas (Dipole, Loop, Long Wire, Beverage, etc) in the amateur radio bands (160m, 80m, 40m, etc). 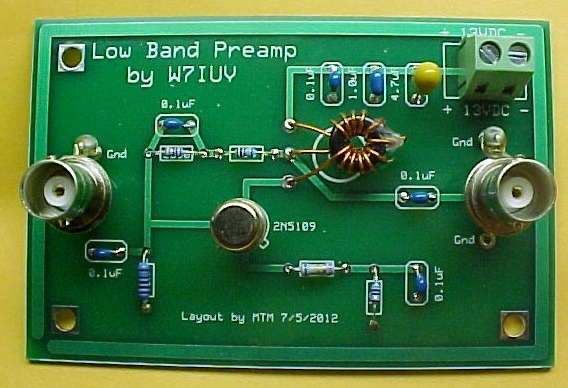 This preamplifier is also be useful for regular commercial shortwave radio reception. Special thanks to W7IUV for making these plans available to the Amateur Radio Community. We have made this kit assembly-friendly by using through hole components and avoiding surface mount construction. 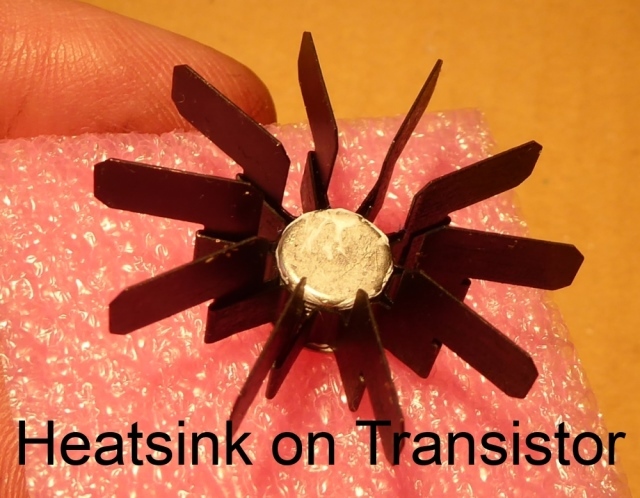 This classic design is based on a single 2N5109 NPN transistor with a large heatsink (See photo below). Note that the amplifier requires a ~13 VDC power supply for operation, which is not included. We ship by 1st Class Mail in the U.S.A. International customers please use the special Paypal link, which includes an additional $10 for shipping by International Postal Mail. Please note: This is a kit requiring assembly, which includes electronic soldering and winding a small coil. We are not able to offer a refund after kit assembly begins. Note: A customer wrote to us to advising that IMD can be an issue with foreign-sourced "Motorola" labeled transistors. We use only transistors supplied from a reputable manufacturer in these kits. ANTENNA PREAMP KIT (Catalog #PREAMP)...$37.50 USA Shipping Included! BY PAYPAL: click the "PAYPAL, Buy Now" button. Quantity can be changed at checkout to order more than one. Mail Orders: Please see below. ANTENNA PREAMP KIT (Catalog #AMP-INT)...$47.50 International Shipping Included! BY PAYPAL: click the "PAYPAL, Buy Now" button. Quantity can be changed at checkout to order more than one. No shipping delays for Personal Checks. We always ship promptly via First Class Mail or International Air Mail.